The Black Brand Killer jacket is on sale! 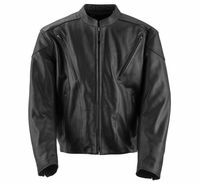 The shell of this jacket is sturdy black leather. And the jacket comes with a removable full sleeve liner. It also has large diagonal zip vents on the front and back. So with the added insulation and the zip vents, it will cover a wider range than most black leather jackets. I’d say it would work from cold weather (especially if you layer underneath) up through warm weather. Hot weather will become a challenge though, even with the zip venting. But hey, its black leather. Black Brand says: The Killer jacket is made from top-grain leather and has sharp looks that reinforce its name. Designed to fit right when you go fast, the Killer has an action back to make riding a motorcycle, or holding onto your girl, a comfortable way to spend the day. Black Brand embroidered on sleeve.